There’s an interesting meta component that runs through the events of “Success Failure,” the fourth season premiere of Silicon Valley. Our erstwhile hero Richard, having managed to stumble back into a position of strength, finds himself dissatisfied and constantly trying to tweak something to its detriment. After some soul-searching, he decides that what he wants to do is to something completely different, identifying a new grand goal that’s admirable in theory but problematic in execution. And to achieve that goal, he scatters his previously identified support network and elects to start from scratch. It’s a direction that feels meta largely because Richard doing so has all the signs of Silicon Valley trying to do the same thing. Season three was a season where, despite comedic highs, the prevailing mood was an inability to commit to the new stakes of the show, pivoting from Pied Piper’s newfound success and ritzy offices to once again making the team impoverished in the confines of Erlich’s living room. And when the finale ended at exactly the same place that the show had been twice before—the team around the table and excited to be in control of their own destinies—it was impossible to shake the feeling of returning to the comfort zone. Now, there’s a feeling that Mike Judge and Alec Berg are as bored with this as Richard and want to try something new, damn the consequences. Those consequences will apply heavily to the rise of PiperChat, Dinesh’s application of Richard’s algorithm to video chatting that’s nurturing a growing user base. Once again, the team is in the position of having a great product that no one wants to pay for, arsenic back in the venture capitalist well after Jared’s click-farming scheme became public knowledge. Dinesh and Gilfoyle are forming an uncustomary united front against Richard, fighting to keep the platform functional whereas he keeps trying to add his own tweaks. And while Erlich and Big Head are the company owners, Erlich is largely kneecapped by the fact that Big Head signed his board seat over to his father, Nelson Baghetti Sr., who considers this a doomed endeavor that at least lets him punish Erlich for squandering his son’s windfall. Things are in a stable position, but it’s a fragile stability, one that’s only maintained by hard work. This point then leads to one of the better interactions of the premiere, as Richard goes to inform the team he’s decided to step down to pursue a new venture—at the same time they’re ready to tell him they’ve made the decision to push him out. And of course it gets a sad underline when Jared barges in the front door, his efforts to break this mess up failing on three different levels. It’s Silicon Valley in a nutshell, grand plans that keep getting laid low by something as rudimentary as going in the back door. Setting Richard off on his own path like this is a ballsy move for Silicon Valley. Its sister sitcom Veep, which similarly lives and dies on the interactions of its ensemble, is off to something of a muted start in its newest season with its team scattered to the winds. Even with Richard still in the same house and licensing his algorithm to PiperChat (and Erlich claiming 10 percent of this new venture, too) there’s a sense as he steps aside that he’s trying to do this on his own, a finality to the framing as he watches them carve up PiperChat like a pesca-pescatarian dinner. 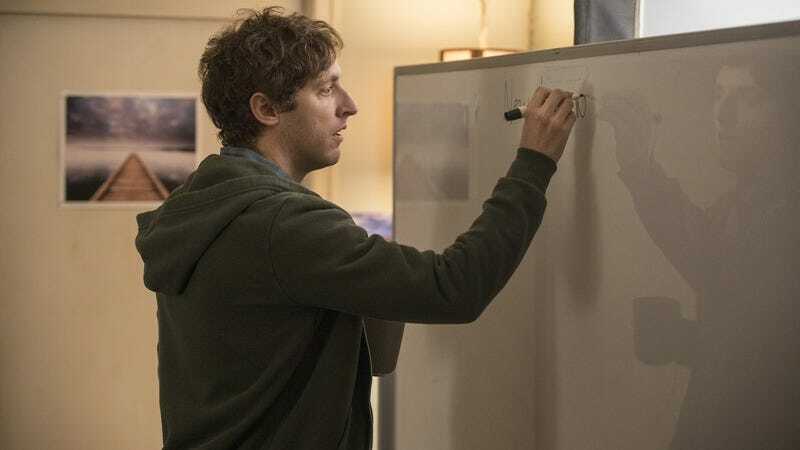 If Richard’s not herding the passive-aggressive cats of Dinesh and Gilfoyle, warring for control with Erlich, or managing Jared’s devotion, it’s a tall order for Silicon Valley to generate something in its place. There are some promising seeds planted in the new move though, chiefly when Richard hands his position as CEO over to Dinesh as the creator of the video chat. Rather than go through the motions of once again setting up Big Head as a puppet president, or having Erlich concoct his latest coup, writer Alec Berg zigs and gives Dinesh an acknowledgment that for once he deserves. Moving Dinesh front and center is ripe with potential, between Kumail Nanjiani getting meatier material to play and the fact that it’s a proven fact Dinesh is a bad person who manages power very poorly. Gilfoyle’s deadpan excitement about how this could fail is contagious in that moment. And while he’s passing over the power, there’s a thread running through “Success Failure” that makes it feel like a fraught transition. Richard’s description of a brand new Internet is full of lofty aspirations, but there’s a possessiveness to everything he does this episode that betrays other motives. He uses the phrase “my algorithm” over and over when describing his plans, acts like the team following him to see his latest brilliant coding move is a certainty (it is not), and makes ownership of the Pied Piper name a deal-breaker that no one even tries to fight for. It feels less like a fresh start than it does the newest and darkest incarnation of his character, years of swimming with sharks like Gavin Belson and Jack Barker twisting his attentions into something ugly. And escalating his intentions to something this lofty and farfetched makes the newest incarnation of Pied Piper only makes the next breakdown all the more feasible. The premiere also breeds some interesting conflict outside of Erlich’s home, with cracks emerging between the aforementioned sharks. While their partnership remains mutually beneficial—a lucrative EndFrame manufacturing contract in China the latest feather in the cap—Gavin’s pettiness doesn’t let him share the spotlight for long. One rerouted flight is all it takes for Gavin to deliver some vintage muffled obscenities and order his hatchet man fly to and from Shanghai a dozen times to get a statistically viable sample for winning an argument, a move that even for him is astronomically expensive pettiness. Matt Ross is always best in an adversarial role, and Stephen Tobolowsky was such a tremendous addition last season that placing the two in opposition is a smart move for Silicon Valley, especially if they remain cut off from the main action. “Success Failure” doesn’t reach the heights of previous season premieres, where Peter Gregory’s death or Jack Barker’s introduction created instant seismic changes to the way the show would operate. In contrast, it’s an episode that’s all about moving on from preexisting stakes, showing how the existing stakes aren’t the best way to spend your time. It’s still peppered with funny beats and character moments, but it lacks the verve and energy of Silicon Valley at its peak, going through the motions at some points and uncertainly trying to find new motions to adapt. Hopefully as Richard and PiperChat embark on their new adventures, they’ll rediscover the right spark of triumph and turmoil. Welcome to version 4.0 of Silicon Valley reviews! As always, I’m happy to be the beta tester for series’ various tweaks and conflicts, and I’m looking forward to your user feedback as well. This Week’s Closing Track: Shazam and Google gave me no results, so if anyone in the comments can fill us in, it’s welcome. The cold open for the episode is pretty great, as Richard poses as an Uber driver to get some venture capitalist face time and “accidentally” gets into a conference call over PiperChat with the rest of the team. Toss-up for best moment is Jared admitting the click-farm scandal was his fault and Dinesh accidentally revealing he’s on the toilet. While last year’s finale implied Monica would be joining the Pied Piper team full-time, she’s still with Raviga and not in Laurie’s good graces, exiled to the office in the back near the mens’ room with an unenviable view of the urinals. Unfortunately this decision also has real-world parallels, Amanda Crew once again sidelined from the majority of the action. Hard to tell which moment was sadder: Dinesh asking Gilfoyle if he can be the CEO of Pied Piper or Richard having to shoo Jared away like a forlorn puppy. Jack has a copy of the Conjoined Triangles of Success in his cardboard box, a diagram which you can now acquire yourself from the HBO store. 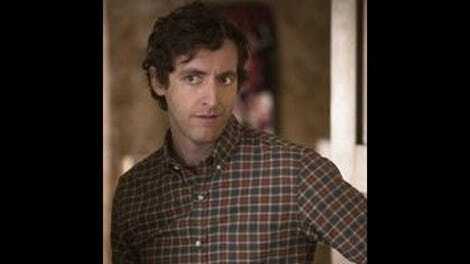 It’s unclear why after Baghetti Sr. threatened to go “full Italian” on Erlich in “The Uptick” the Silicon Valley team elected to hire an actor of Irish descent (Patrick O’Connor) to play Big Head’s father. What in God’s name is up with Erlich’s facial hair this season? It’s a hipster interpretation of Wolverine meets Civil War veteran.